— A new astronaut walkway added by SpaceX to a historic NASA launch pad looks decidedly different from the heritage hardware it is replacing, but it carries on a 50-year legacy leading crew members to their ride to space. 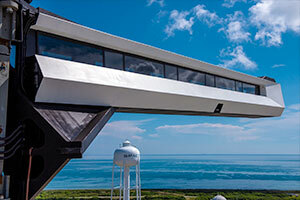 "Crew access arm installed at Launch Complex 39A in Florida; will serve as a bridge for NASA astronauts to board Crew Dragon," wrote SpaceX on its social media accounts on Friday (Aug. 24), captioning a photo of the sleek new ramp. The 85-foot-long (25-meter) arm was delivered to the base of the Pad 39A Fixed Service Structure (FSS) at Kennedy Space Center on Aug. 15. Five days later, it was hoisted by crane 265 feet (80 m) above sea level, where it was mounted to the space shuttle-era tower. The walkway was attached 70 feet (21 m) higher than the orbiter access arm that extended from the FSS for 30 years. The higher perch aligns the access arm with the Dragon when positioned atop SpaceX's Falcon 9 rocket. Like the Dragon and Falcon, SpaceX's crew access arm is mostly white in color, such that it stands out from the metal gray FSS, especially when set against the blue sky and ocean behind it. The new walkway is also enclosed, with windows running along its walls rather than the open air configuration of the prior arm or the tower standing beside it. 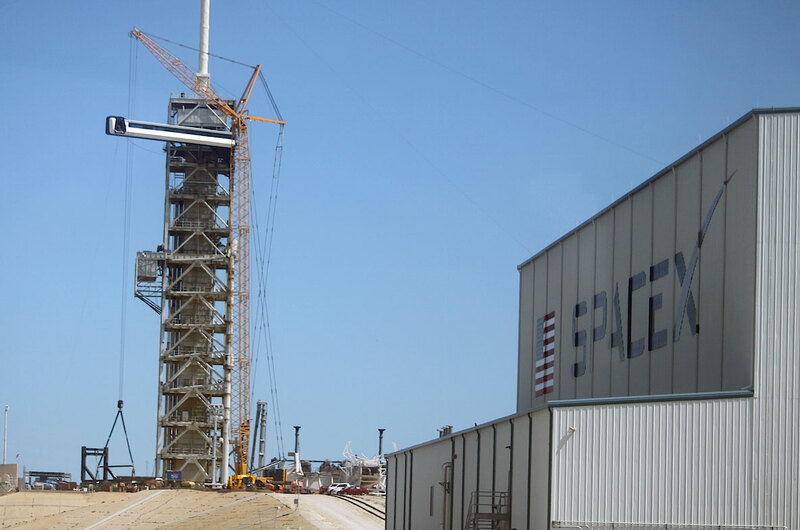 The plan going forward is to install cladding on the FSS, enclosing the tower, because it "looks brutal otherwise," SpaceX CEO Elon Musk wrote on Twitter on Friday. The new crew access arm will see its first use in support of an uncrewed test flight of the Crew Dragon, which SpaceX has targeted for November. If all goes to plan, NASA astronauts Doug Hurley and Bob Behnken will then become the first to use the arm to board a Dragon to launch on a demo mission to the International Space Station slated for no earlier than April 2019. The SpaceX access arm is the second commercial crew conveyance to recently be added to a launch pad. In August 2016, United Launch Alliance (ULA) mounted the astronaut walkway for Boeing's CST-100 Starliner spacecraft atop Space Launch Complex 41 at Cape Canaveral Air Force Station in Florida. 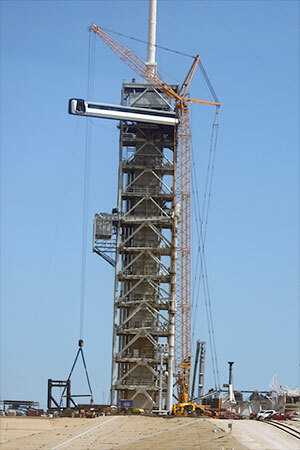 The 50-foot (15-meter) arm was installed 172 feet (52 m) above the ground, where it will bridge the gap between the pad's gantry tower and the Starliner atop a ULA Atlas V rocket. At the spacecraft end of the open-air ULA walkway is a "white room," an enclosed, environmentally-controlled cabin that serves as the interface to the Starliner's crew cabin. The white room that was mounted to the arm two years ago was recently replaced to "enhance the capability" for Boeing's Starliner and to ensure "flexibility for future commercial launch partners," a ULA spokesperson told collectSPACE. The height of what ULA now calls the "Common White Room" was increased by 4 feet (1.2 meters). For the most part, the room features the same equipment and functionality of the prior model, but some of the locations for storage and communications connections were changed to improve access based on lessons learned with the original configuration. The Common White Room, which sports a U.S. flag and ULA logo on its exterior, was lifted by crane into position on May 9. 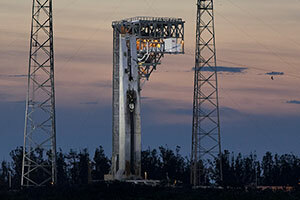 It was in place and configured for a first Integrated System Verification Test (ISVT) in June. Boeing is targeting its first Starliner uncrewed orbital flight test for late 2018 or early 2019. A crewed test flight with Boeing astronaut Chris Ferguson and NASA astronauts Eric Boe and Nicole Mann aboard is slated for mid-2019. Although the use of white rooms date back to NASA's Gemini program in the early 1960s, the crew access arm was not introduced until the Apollo program in 1967. The original walkway spanned the gap between the support gantry on Complex 34 and the Apollo spacecraft atop a Saturn IB rocket. 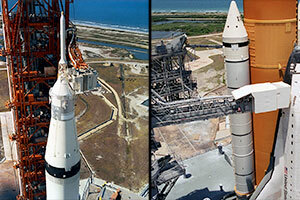 Pad 39A's first crew access arm was installed 320 feet (100 m) above the launch pad surface, bridging the distance between the launch umbilical tower and Apollo command module atop the towering Saturn V rocket. The same configuration was used on Pad 39B in 1969, where NASA now plans to launch crews on the Space Launch System with a new Orion crew access arm.